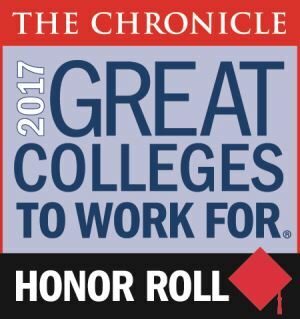 OGDEN, Utah – According to a survey commissioned by The Chronicle of Higher Education, Weber State University is one of 18, similarly sized institutions nationwide that made the “2017 Great Colleges to Work For” Honor Roll. The results, released this week in The Chronicle’s 10th annual report on The Academic Workplace, are based on an employee survey conducted at 232 colleges and universities nationwide. In all, only 79 of the 232 institutions achieved “Great College to Work For” recognition for specific best practices and policies. The 42 universities of any size, including Weber State, that received the additional Honor Roll distinction had high employee marks in multiple categories. Results are reported for small, medium and large institutions with Weber State included among large universities of 10,000 or more students. Employees are given the opportunity to develop skills and understand requirements to advance in their careers. Employees are regularly recognized for their contributions. Faculty members say the institution recognizes innovative and high-quality teaching. Faculty members say requirements for tenure are clear. Faculty members are appropriately involved in decisions related to academic programs. Leaders have the necessary knowledge, skills and experience for institutional success. Facilities meet employees’ needs; the campus appearance is pleasing, and the institution takes steps to provide a secure environment. There is an overall sense that the job is meaningful to the employee and the institution. University policies give employees the flexibility to manage their lives on the job and at home. The survey is one of the largest workplace recognition programs in the country and recognizes the colleges that get top ratings from their employees on workforce practices and policies. To administer the survey and analyze the results, The Chronicle used ModernThink LLC, a strategic human capital consulting firm that has conducted numerous “Best Places to Work” programs, surveying hundreds of thousands of employees nationwide. The Great Colleges survey included a two-part assessment process: a survey administered to faculty, administrators and salaried staff (the ModernThink Higher Education Insight Survey) and an institutional audit that captured demographics and workplace policies and practices. The primary factor in deciding whether an institution received a Great College to Work For recognition was the employee feedback. To view the results of the survey, visit chronicle.com/AW17. Visit weber.edu/wsutoday for more news about Weber State University.
" + this.outerHTML + "